On the left side of the Green corner, 4 А (40 m, V) (the route of A.Brunza, 1991 ). The western part of the massif and the most difficult South-eastern walls are divided by the big corner, downward from the plateau which is named Green because of the moss covering it. The route starts near the base of the couloir, coming down the Green corner. Go about 150 m to the direction of Baidary Gates from the alpinist camps under Forossky Kant till the beginning of the ascent to the Green corner. From the road move upwards by slide-rocks to the abrupt wall. Getting over the small wall, go to the right along the ledge to the big corner, situated on the left side of the break and turning above into the vertical chimney. (R0: 100 m, 30 0, в / к 8 m, 75 0, III 10 m, 40 0, б/к ). On the section R1-R2 go upwards along the corner to the top of the break (R1-R2: 30 m, 75 0, IV). On the section R2-R3 firstly go upwards 8 m to the small overhang. Then, having got it, go upwards and little to the left by the abrupt wall 30 m. (R2-R3: 20 m, 80 0, V 20 m, 75 0, IV). On the section R3-R4 go to the left and upwards to the left side of the Green corner (R3-R4: 40 m, 60-70 0, III). The reference point of the next section is a big pine-tree in 50 m from the base of the corner. On the section R4-R5 – firstly go upwards and to the left to the old juniper. Then go upwards by the vertical corner to the pine-tree (R4-R5: 40 m, 70 0, III). On the section R5-R6 – go upwards from the pine-tree: firstly by the chimney, then along the corner (R5-R6: 40 m, 70 0, III). On the section R6-R7 – mainly go upwards 100 m by the steep walls and corners (R6-R7: 100 m, 60 0, II). On the last section of the route go upwards and to the right by the slide-till the plateau (R7 - яйла: 100 m, 40-50 0, б/к ). Length of the main part of the route а is about 300 m.
Time is 3 – 4 h.
From the road move upwards by slide-rocks to the abrupt wall (R0: 100 m, 30 0, в/к ). On the section R1-R2 – having got the small wall, go to the right along the ledge to the big corner, turning into the vertical chimney on the left side of the break. Go upwards along it to the top of the break (R1-R2: 8 m, 75 0, IV 10 m, 40 0, б/к 20 m, 75 0, IV). 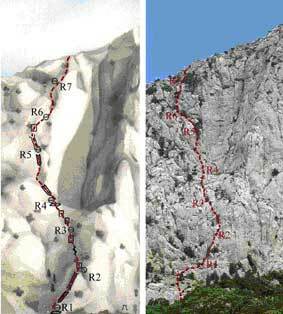 On the section R2-R3 – firstly go upwards 5 m to the small overhang by the break, then, , having got it, go upwards and little to the left by the abrupt wall 30 m (R2-R3: 20 m, 80 0, V 20 m, 75 0, IV). On the section R3-R4 – little to the left, then upwards till the horizontal ledge in the base of the Green corner (R3-R4: 80 m, 60-70 0, III). On the section R4-R5 –go firstly to the right and upwards, then 25 m upwards along the corner to the overhanging wall. It is passed head-on. Then go along the corner till the 10-meter vertical chimney (R4-R5: 50 m, 80 0, V). On the section R5-R6 – firstly go upwards by the chimney, then ascend by the slab with a small crack. Then to the right till the big crack filled with grass. (R5-R6: 40 m, 85 0, VI). On the section R6-R7 – go to the small overhang above the crack. It is passed in its right part. Then go upwards, firstly by 7-meter corner, then by the slab to the big cornices. 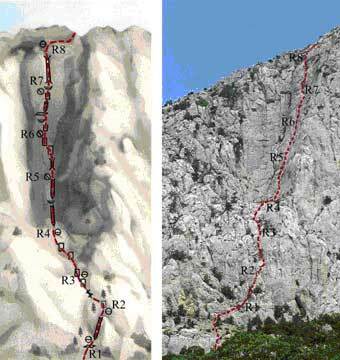 They are passed firstly right to the left, then upwards, and in the end it is a small traverse to the right (R6-R7: 40 m, 80 0, V). (R7-R8: 40 m, 80 0, V+). On the last section of the route go upwards and to the right by middle-grade rocks till the plateau (R8-the summit: 40 m, 70 0, III). Length of the main part of the route is about 400 m.
Time is 4 – 5 h.
P.S. Vladimir Timofeev, master of sports of USSR in alpinism and climbing, reiterated champion and prize winner of USSR championships in alpinism.